It’s the final insult for the late Zsa Zsa Gabor, who passed away at the age of 99 at her Bel Air home. In 1986 when Zsa Zsa took Frederic Von Anhalt for her ninth husband, she thought she was marrying royalty – a legitimate German prince – and that made HER royalty too! Eventually she learned that Frederic’s royal ties were questionable at best, but by then she was too ill to object. As her health declined, Zsa Zsa spent most of the last decade in bed in a vegetative state. Fredric sold photos of her looking awful in bed to tabloids! And he cut off her daughter Francesca Hilton’s allowance, so when she died, she was living in her car! All the while, Von Anhalt was “adopting” numerous young men to give them Princely titles. 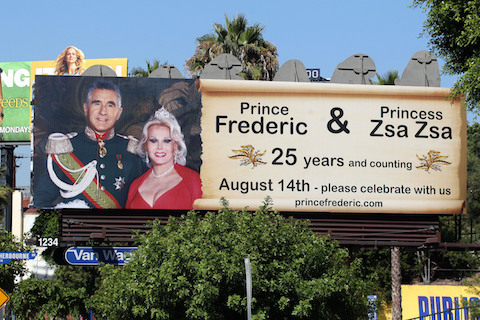 When Zsa Zsa mercifully passed away Dec 18, Fredric hired a publicist to arrange a “star studded” memorial service. A list of celebrities “expected “ was distributed to the media. The “Prince” hoped to earn big bucks for media access. It turns out NONE of the listed celebrities agreed to attend and don’t plan to! A small but genuine memorial service for her friends will be happening in January after the holidays.